Pythium root rot can be caused by multiple species of the oomycete Pythium. In greenhouse systems, the most commonly isolated pathogen is Pythium myriotylum. 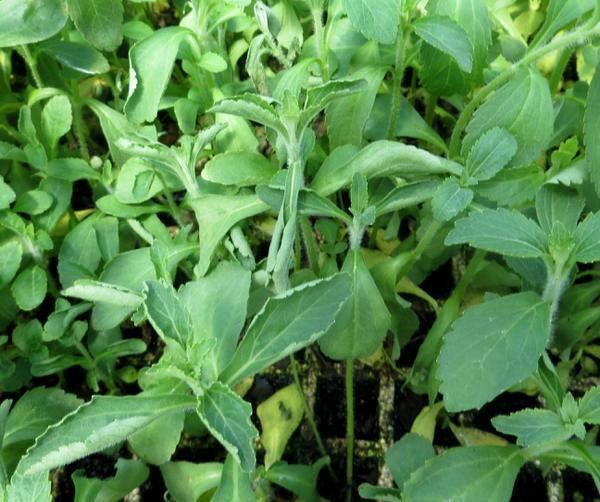 In field plantings, P. irregulare and P. aphanidermatum have been isolated from stevia. Pythium species have a wide host range and are commonly associated with float tray production systems. Pythium myriotylum was first observed in stevia greenhouse float systems in 2015. 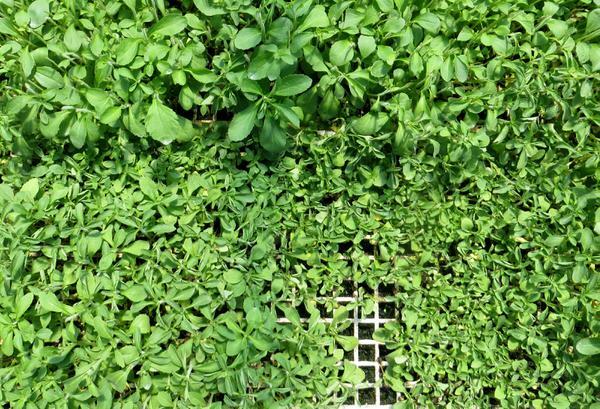 Symptoms are most notable in float systems used to produce stevia seedlings for field transplant. Foliar symptoms may include plant stunting (Figure 1) and leaf curling (Figure 2). When symptomatic plants are pulled from the tray, root lesions and necrotic dead roots are often observed (Figure 3). In the field, symptoms from Pythium root rot are not as easily visualized as greenhouse production. Figure 1. 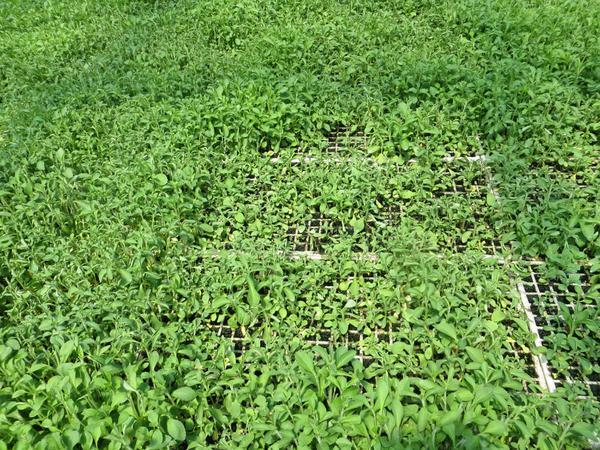 Stunting of float tray produced stevia seedlings caused by Pythium myriotylum. Figure 2. Stevia plants exhibiting leaf curl symptoms caused by Pythium myriotylum. Figure 3. Necrosis and death of stevia seedling roots with Pythium root rot. Pythium is able to produce sexual (oospores) and asexual (zoospores) stages. Zoospores are motile and require free water to move allowing them to thrive in water environments like greenhouse float systems. Oospores or other propagules may survive in pores of float trays and serve as the primary inoculum for new infection in float systems. Infected plants will display symptoms of stunting and leaf curl and have very few healthy roots when transplants are pulled from the tray. Infected plants that are transplanted to the field may have difficulty withstanding environmental stressors such as drought or high temperatures due to their reduced root system. If plants can survive the initial transplant window, they are often able to recover and outgrow visible symptoms as plants mature. However, the impact of Pythium root rot and other soilborne pathogens on ability of stevia to survive into perennial production is still under investigation. Figure 4. Stevia float tray greenhouse with contaminated trays showing symptoms or Pythium root rot. Figure 5. Recycled float trays with Pythium inoculum following chlorine-bleach treatment. Proper sanitation is the first line of defense to Pythium root rot in stevia greenhouse float systems (Figure 4). If using Styrofoam trays from season to season, trays can be maintained through steam or chlorine-bleach treatments. Since the phase out of fumigants like methyl-bromide, steam sterilization at 170-180˚F for 30 minutes has been the most effective tray sanitation method, but can be cost prohibitive. Alternatively, trays can be dipped in a 10% chlorine-bleach solution and rinsed to remove bleach residues. However, research has shown that the chlorine-bleach dip method is not as effective as steam sterilization. Styrofoam trays become more porous over time and become difficult to effectively sanitize using dip methods (Figure 5). Avoid use of water sources like unfiltered pond or creek water that could be primary sources of Pythium inoculum. Fisher L, Vann M. 2017. Producing healthy transplants in a float system. North Carolina State University: Flue-cured tobacco production guide 2017. 44-57. Koehler A.M., Lookabaugh E.C., Shew B.B., and Shew H.D. 2017. First report of Pythium root rot of stevia caused by Pythium myriotylum, Pythium irregulare, and Pythium aphanidermatum in North Carolina. Plant Disease. 101:1331.